The match you're talking about was Tasmania's encounter with Queensland in Brisbane in 1987-88. There have been a few instances like this one, but the record - an unbeatable one, I would suggest - is held by the Glamorgan fast bowler Peter Judge, who was dismissed twice in about a minute during a match against the touring Indian team at Cardiff Arms Park in 1946. Judge was bowled by Chandu Sarwate to end the first innings, and the Indians asked Glamorgan to follow on. There wasn't much time left in the match, so Glamorgan's captain Johnny Clay (who was the not-out batsman) decided to give the crowd some fun, didn't bother with the usual 10 minutes between innings, and reversed his batting order... and Judge was promptly bowled by Sarwate's first ball of the second innings. The South African slow left-armer Nicky Boje had figures of 0 for 221 from 65 overs in that record-breaking match in Colombo in July 2006. Wisden reported that Boje was nonetheless "the most effective of the bowlers, operating over the wicket for much of the innings and directing the ball into the rough". Rather surprisingly, Boje's figures are not quite the worst for a bowler failing to take a wicket in a Test innings - and perhaps even more surprisingly, the record-holder is a fast bowler rather than a spinner. When Garry Sobers set the then-record Test score of 365 not out in Kingston in 1957-58, Pakistan's Khan Mohammad finished with 0 for 259 from 54 overs as West Indies piled up 790 for 3. Pakistan's opening bowler Mahmood Hussain pulled a thigh muscle after sending down only five balls of the first over, increasing the workload of the others. Khan, a charming man who sadly died recently, would later recount the tale with a whimsical smile: "Everyone always asks me about my 0 for 259. They never ask about the time I got Len Hutton out for a duck at Lord's!" For a full list of the most runs conceded in a Test innings, click here. Australia's Marcus North became only the second man to play first-class cricket for five different counties when he made his debut for Hampshire on April 22 this year, having already played for Durham (2004), Lancashire (2005), Derbyshire (2006) and Gloucestershire (2007-08). He was beaten to the five-county landmark by just a week - fast bowler Andrew "AJ" Harris made his debut for Leicestershire on April 15, after having previously played for Derbyshire (1994-99), Nottinghamshire (2000-08), Gloucestershire (2008) and Worcestershire (2008). Two old friends lead the way in both categories here. In Test matches Muttiah Muralitharan has so far claimed 45 wickets through stumpings, while Shane Warne had 36. In third place is another Australian legspinner, Clarrie Grimmett, whose 216 Test wickets included 28 stumpings (that's 12.96% of his dismissals). 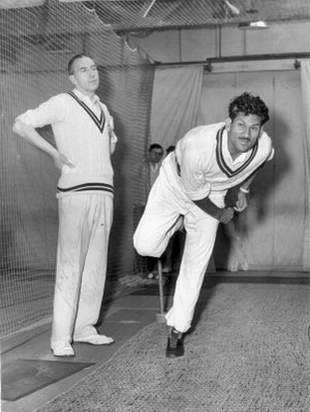 In fifth place, India's Subhash "Fergie" Gupte had 20 stumpings in 149 dismissals, an even higher ratio of 13.42%. Anil Kumble lies fourth (24 out of 619). In one-day internationals Murali leads the way with 55, just ahead of Warne (50), with Sanath Jayasuriya a rather surprising name in third place with 42. The left-hand batsman Jeff Moss did indeed play one Test for Australia, against Pakistan in Perth in 1978-79, scoring 22 and 38 not out (he was in at the end as Australia completed a series-levelling seven-wicket victory) to give him an average of 60.00. This was at the end of the divisive conflict with Kerry Packer's World Series Cricket, which kept most of Australia's first-choice players out of the Test team, and when they returned later that year Moss could not earn a recall. He did play one match in the 1979 World Cup in England, when Australia tried (and failed) to cope without their Packer players. Moss, who played most of his club cricket for Melbourne, continued in first-class cricket for Victoria until 1982, finishing with 3416 runs at the respectable average of 43.79. His highest score was 220, which came not long before his one and only Test cap, against South Australia at the MCG at the end of January 1979. The highest score by anyone in his last Test innings is 258, by West Indies' Seymour Nurse against New Zealand in Christchurch in 1968-69. There have been two other last-innings double-centuries: Aravinda de Silva signed off with 206 for Sri Lanka against Bangladesh in Colombo in 2002, while Jason Gillespie made 201 not out as a night-watchman for Australia against Bangladesh in Chittagong in 2005-06. The highest score by a batsman in his final Test is 325, by England's Andy Sandham against West Indies in Kingston in 1929-30, but he batted again in the second innings (and still had enough energy to make 50). "With regard to bowlers bowling with both their left and right arms, Sri Lanka's Hashan Tillakaratne did this during a big World Cup win over Kenya in Kandy. during the 1995-96 World Cup. He bowled three deliveries of his only over with his right arm, then switched to his left for the remaining three." Tillakaratne had earlier been run out for a duck in Sri Lanka's total of 398 for 5. Another bowler who occasionally changed from his normal right-arm variations to slow left-arm was the extrovert Australian Colin "Funky" Miller.